BUCKCHERRY announces Leg One of their Warpaint North American tour today. 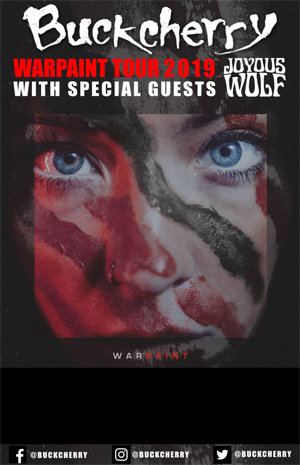 The tour begins in Sacramento on March 6th to coincide with the March 8th worldwide release of their new full-length album Warpaint. Leg One will cover markets in the U.S as well as Western Canada. Support on leg one will be provided by Roadrunner Records' artist JOYOUS WOLF. Leg Two will run from the end of May through September. VIP experiences will be available for all shows and can be purchased at Buckcherryvip.com. "After spending all fall recording our new album Warpaint, we are excited to play these new songs along with all of the BUCKCHERRY favorites on the road throughout all of 2019," states BUCKCHERRY frontman Josh Todd. Dates for leg one are below. For more information on the band's upcoming tour dates, fans can visit BUCKCHERRY's website.